Reduce mixing time by 10%-30% and shorten rising time by up to 50% with this Lessafre SAF-Instant Red dry yeast 1 lb. vacuum pack! This SAF yeast, also known as "bread machine yeast", differs from active dry yeast in that it does not need to be dissolved in warm water before it is used, saving you time and, ultimately, money! Great yeast, never fails us. I like that the case comes with 20 individual pounds of yeast because I can pull what is needed for the day and leave the rest in storage. This is a reliable yeast. It has lasted in my refrigerator for over a year without loosing it's quality. I use it for breads and pizzas in my bread machine and for dough I mix by hand. Love this yeast. I mix it in directly with flour for making my yeast breads, cold everything, but this yeast never fails me. Great oven spring with it. Yeast works great for our pizza dough. Nice flavor and I have never been disappointed in this product. Never any problems. What a great price too! We make our own specialty yeast doughnuts in house and this yeast is perfect. Love the low profile vacuum packed bags that don't take unnecessary storage space. Great value, highly recommend! I bought this and finally used it to make cinnamon rolls. I was nervous but the instructions was on point. You wont go wrong using this and you must follow the instruction to the T.
works great and long shelf-life much more economical the small packets from the grocery store. I use for all yeast baked goods including breads and danish dough. This yeast is very comparable to the name brand and performs the same. I would also recommend buying by the case for a better value. This product s the only brand of yeast we use at our bakery. There is no comparison to any other brand for quality or price. the best dry yeast by far! it helps with waste (we used to use fresh compressed yeast and used to discard a lot). act really fats but not overproofing your product. vacuum seal product so it will last long. This yeast is top value for the money. It is very reliable, and the package makes it easy to measure. We like it very much. This yeast is hard to beat. I've used this brand for years now, baking for personal use, for orders, and for farmer's market. It's so easy to use, and the price is excellent. This is a very good product, and freezes well to keep fresh until ready to be opened and used. It's nice to be able to buy yeast in bulk, and this is a brand that we trust. Great for making breads, desserts, bagels, etc! I always go for the SAF Instant Red Yeast in the 1 pound size when I need to get yeast. Yeast is expensive and the 1 pound containers go a long way.. great value. Reliable product.. I can always count on a good rise when I use SAF. 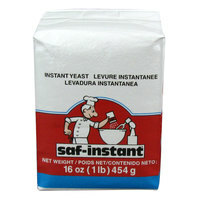 I use this instant yeast whenever I make homemade pizza and artisan breads. It is definitely cheaper to buy the one-pound package if you do a lot of baking. I like to store the yeast in the freezer in a plastic bag. This is definitely a "must have" for my home baking needs! i've been using lesaffre yeast to make breads and doughs for years and it's always reliable and potent. this dry yeast can be stored in the fridge or freezer for well over a year without issue. This is great instant yeast, and the vacuum packaging keeps it fresh until I am ready to start using it. After opening, I keep this yeast in the fridge in an airtight container. I always have great results. In my opinion one can't do better than Lesaffre yeast. This product was received in perfect condition and is very fresh. If that wasn't good enough, the price can't be beat anywhere. I will buy my yeast from Webstaurantstore.com from now on. Great price for a great product. We use this instant yeast in our breads and our Swedish cinnamon rolls and have never been disappointed. Love never having to proof the yeast! I’m a home baker and I go through a lot of yeast since I make my own bread, pies, and other pastries. I prefer instant yeast because if it’s quick rise. I love that I can buy in bulk from Webstauarant and save money in the process. This is my go-to yeast for bread! webstaurantstore.com has the best price of any place I've checked, and always ship fresh batches. I've never had a loaf fail with this yeast. I've bought this multiple times and will continue to do so. I am super happy with this yeast so far! I stored in the freezer the moment I got it. have already used it for a couple of breads and even a babka! Worked well. This is a fantastic price on a 1LB bag of SAF Instant. Red is great for standard duty baking (Gold is tailor made for higher sugar doughs). I've kept repackaged bags in the fridge, and have never had any issues with potency or consistency. I'm a home baker, so I don't have experience with commercial production or scale - but I do have experience with longevity, and SAF hasn't fallen flat after prolonged storage. I appreciated that this was vacuum packed when it arrived to preserve freshness. The yeast works just fine as yeast should. A great price as well. Works great every time I make great bread with this yeast and a great deal compared to buying those darn packets. I use mine for home use. We like this Lesaffre yeast because it cuts a significant time bread making. We use this when making pastries like this pecan cinnamon coffee cakes. Makes the dough light and soft. This instant yeast is a great addition to your commercial and home kitchen. It makes a great tool in your baking arsenal and works better than regular yeast. Best instant dry yeast, never fail to me , great quality for a very cheap price, excellent product, dough rises up very well so happy with this! If you want to buy in bulk but not use the product instantly then this is for you. Comes smartly packaged in vacuum sealed bags to ensure the yeast is not ruined. An excellent buy. great yeast. very good results with all our breads and rolls. excellent price and available quickly. works great with our bread machine and hand mixes. Lesaffre yeast is obviously a great value. Having this low cost choice from WebstaurantStore is a great way for me to make many loaves of bread and other yeasted dough goods. This is a great price for a one pound pack of Instant yeast, Making bread or dough with this is so easy. Plus it has a long shelf life. Perfect product in the use of making my pizza dough. it makes the perfect crust which give the business a lot of compliments from the patrons. Great price on instant yeast! I ran out and didn't have time to shop at my normal supplier so I just added this on to my order! Works great! Any discerning baker is likely to be using Lesaffre SAF-Instant Red Dry Yeast. It's a very reliable yeast that always brings consistent results. 1 pound is more than it looks like when you get it as it expands the second you open it. As a home baker who often uses sourdough instead of commercial yeast, it's taken me a while to work my way through this pound of yeast. I keep it in the freezer in a mason jar and the batch I purchased in 2011 is still going strong. I proof it every time but don't know why I bother, it's still fully active and producing great loaves that perform to standard expectations (i.e., dough doubles in volume in an hour). This yeast is great. We use it for all our homemade artisan pizza's as well as our fresh baked breads. Very pleased with the quality. Great yeast to use if you need product to rise quickly. I was not sure it would work that way but it sure does. I am leaning towards using this yeast all the time. Lesaffre instant yeast is a great buy. The package arrived with a great seal and the yeast was very fresh. We have baked several loafs with this yeast and they have all come out great. This is my favorite brand of yeast. Love the big package and it stores great in the freezer. The rise is very nice too. Will always buy this. Unless you can get a hold of fresh yeast, I think this is the best yeast on the market. No proofing necessary and it seems to be still potent after a year. This yeast is the best I have ever used. My breads are higher and beautifully textured, no matter what kind of bread I make, and no matter the ingredients. The price cannot be beat. I can't believe I used to buy those horrible little packets of low performance yeast in the grocery store. I recommend this yeast as the very best. This yeast works great! I use it for my breads and waffles and they come out perfect every time. Kept in the freezer you will get a year easy, if not longer. First baked item I made with Saf instant yeast was a tried and true challah. The bounce and rise on the bread was phenomenal and looked so lovely. Highly recommended yeast with fab results. This yeast is awesome! No problems with baking and goes straight from freezer into the dough. Didn't realize how much 1 lb. is and I have enough to last myself for a long time. This is the best yeast I've ever used. I do a good bit of bread making & baking, it's reliable and does a great job. This instant yeast always worked well for us - on our bread and pizza dough. Webstaurantstore seems to sell them the cheapest and they make great add-ons to our order. I have only ever used Lesaffre SAF-instant yeast for my breads! I love it! It keeps (refrigerated) for much longer than the recommended time frame and has never let me down! I bake all the time and this yeast works great. It rises in a short time and it works great not only in bread and pastries but in naan, pita and pizza crusts. It rises beautifully. I have been using Lesaffre SAF-Instant Red Dry Yeast for almost a year now. I am so impressed, it cannot compare to the packages. I use it in everything from sweet breads to pizza dough and honestly I have had not one catastrophe! This is a real feat to me as yeast doughs are not my specialty. I consider myself a practicing "yeast dough baker" this product is giving me a lot more confidence. Then again maybe it's my lucky charm! The packaging was very carefully done. I ordered 25 boxes and every one of them was in perfect conditions. I've used almost have of them and every pack have been in perfect conditions as well. This yeast is great for bakery purposes. A most in every bakery!!! This is good quality yeast. This is instant or "rapid rise" yeast, meaning that in most applications, you don't need to mix it with warm water before addiing it to recipes. Great price. This yeast works great in my bread machine. It is so much cheaper than bread machine yeast and works just as good. Why pay more? This is great yeast! I h a very no worries that my breads will not rise when using this yeast. No need to proof, which is great for someone with no patience! Saf-instant Red yeast is excellent and provides a great rise whether in a bread machine or hand mixed. Really like to use this yeast. I use it in sweet rolls to rye breads. Since getting this yeast I have made 4 loaves of white bread, hamburger buns and 2 pizzas all without prepping the yeast in warm water. I throw it straight in with all the other ingredients and each time the dough has risen perfectly. Each thing has came out nicely. Will definitely be buying more of this yeast! this is the best brand of instant yeast that I've worked with in the industry. The packaging was suitable for its travel and was definitely cheaper than buying several smaller (0.24 oz) packages at the local grocery. Great price. Great product. I switched to Lesaffre SAF-Instant Yeast after doing some reading on bread making. This was always on the top of the list as being one of the best. I'm hooked. Not only do my breads rise well, they smell fresher and taste better. This is the best yeast I have ever used. I make a lot of bread recipes and it has never failed once. I keep it in the freezer and it will last a year or more. This yeast is the best and easiest yeast to work with. I have taught many people to bake bread and always suggest they use this yeast because I know they can easily succeed on their own. You can add the yeast directly to the dry ingredients without having to proof it first and it works great with all raised breads. Quality alone sells me on the product, but the price here is amazing! We really like this yeast as it has worked well for us at a very good price point, too. We always keep ours frozen after opening and have had no problems with it lasting. Love the feel of this paper, not to thin. I also find I can usually get more than one use out of it when I bake. Saves time from having to always wash a sheet pan. The price for this 1-lb package cannot be beat. You will want to store this product in the freezer to maintain the freshness. Instant yeast is so easy to use- just add in with your dry ingredients. The price cant really be beat. You will not find another website or store that will sell it for this low. The quality is great as well. Have been using SAF Instant Yeast to make whole wheat bread for a few years now and it works fine. It can also be used to make bread in the bread machine rather than buying the more expensive bread machine yeast. I keep it in a glass jar in the freezer and it keeps well that way. BEST QUALITY YEAST OUT THERE. Do not waste money on supermarket yeast. This is the best quality yeast out there and the price is perfect. I pour the yeast into a 26oz metal container sold on this site and store in the freezer. It lasts over a year. The best dry yeast on the market. At a price cheaper than you will find anywhere else. Product is fresh, makes fantastic breads, and no holes or any other problems in shipping. This is great instant yeast for the price. These 1lb packages are a good size for the home baker. I make pizza frequently and this stuff works well for a quick pizza dough. What a wonderful deal on a great product. I paid more elsewhere. This yeast also works great with bread machines, and we are sure to buy more. Having never used an instant yeast before, I am sure enjoying this on. Every loaf rises beautifully. The price is fabulous here. I had been unable to find this product in the retail market in my area. This is super reliable yeast that produces a great rise and never fails. I store the yeast is in airtight container in the refrigerator but if you don't bake that often you might want to freezer part of the package. Another bonus about this product is that doesn't require proofing. This SAF yeast is fantastic. It has awesome shelf life, I store mine outside the cooler at room temp. It makes my doughs rise very well and is always reliable. I can't get this locally. I loved being able to not have to proof my yeast before adding it to my flour. Great price too! I love using this yeast. Just make sure to refrigerate it after opening it. It's the brand that I grew up using for breads and other pastries. This yeast produces the best bread and pizza doughs. I Never have any issues with improper rising. If consistent results are what your after, this is the yeast to use. This yeast is a great value, and works great with all sorts of breads. Think it might last you forever? Transfer to an airtight container and keep in the freezer, and it will keep a good, long time! This instant yeast is great for baking your own bread and has a great taste! Just dissolve in warm water! It's as easy as that. Great price and quality. Great brand of yeast!! Perfect for the home baker! Nice item to have for any restaurant that enjoys baking fresh dinner rolls from time to time!!! Foolproof! Great yeast at a great price - 2 years using this product and have great success. Vacuum sealed packages give long shelf life to boot! Hello. I bake a lot this time of year and again in the Spring for the holidays. [Sometimes as much as 100 loaves of bread and dozens of muffins and rolls. For friends and "community service" reasons] This is great instant yeast! It is vacuum sealed and will last at least a year even after opening. If refrigerated it can last a few years [sealed tightly]. If vacuum sealed and frozen it can last 7 - 10 years according to the manufacturer. [I contacted them years ago]. i have some that was frozen and vacuum sealed that was five+ years old. Worked great both in the bread machines and as in artisanal bread. Great stuff!!!!! Great store!!!!! I love this yeast, use it for all my home breadmaking, and The WebStaurant Store has the best price on it that I have been able to find! And, you only need to use 75% of this compared to active dry yeast and it goes into the recipe with the other dry ingredients - no need to proof it first! This has always been the cheapest deal on yeast that I could find. I've never needed to proof it. I store it in either my refrigerator or freezer. SAF Yeast is the best for baking and you cannot beat the price for it at Webstaurant. This is the exclusive yeast of King Arthur Flour's test kitchen, yet with a much better price here at Webstaurant than they sell. I will be buying from here again and again. Am telling all my colleagues about Webstaurant.